Submitted 10 months 3 weeks ago by bucks4life. 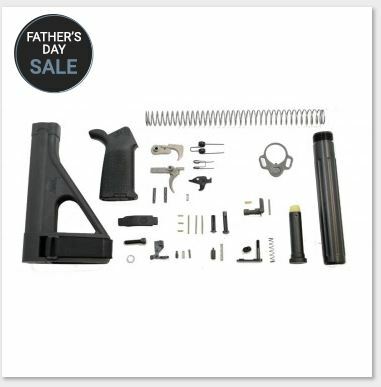 A high quality lower build kit with everything you need to assemble your AR-15 lower into a pistol. Features polished hammer and trigger contact points, and black oxide coated hammer and trigger springs. Also includes PSA's Enhanced Polished Trigger (EPT), an SB Tactical SOB Pistol Brace, castle nut, double-looped pistol latch plate, carbine buffer spring, and standard carbine buffer.